we are manufacturers and exporters of african handmade wedding specials stone work georges. It is made with raw silk fabric with special stone work and well trained with so many years experience with handy work jobs. We can give you even one george to any number of georges as per customers requirements. Also we are doing customized designs as per customers required for group or single person. Established in the year 1952, we, “Aspiration Traders”, are a leading firm engaged in manufacturing and exporting a superior range of George, Silk Damask Fabrics & Computer Laces. Under this range, we offer Computer George Fabric, Computer Design Fabric, Mango Design George, George Saree Fabric, Raw Silk George, Swiss Mango George, Raw Silk Fabric, Designer Raw Silk, intorica, african dresses, intorica george, african george, george wrapper, african george wrapper, african textile and Golden Damask, to name a few. These fabrics are stitched utilizing high grade yarns, procured from reliable vendors of market. The offered range of george fabrics is highly appreciated among the clients for its comfortable to wear nature, colorfastness, skin friendliness and tear resistance. In addition to this, the silk fabrics offered by us are admired in the market, owing to their features such as unmatched quality, smooth texture, weaving strength and durability. The damask fabrics offered by us are stitched using organic cotton, which is sourced from trustworthy vendors of market. These fabrics are acknowledged for their stain resistance, easy wash-ability and remarkable patterns. In addition to this, we are engaged in trading an unparalleled range of Remy Hair & Wigs. This range includes Straight Wigs, Short Hair Wigs, Wavy Hair Wigs, Remy Human Hair Wigs, Natural Lace Wigs, amongst few. The wigs offered by us are applauded for their durability, skin friendliness, reliability and light weight. 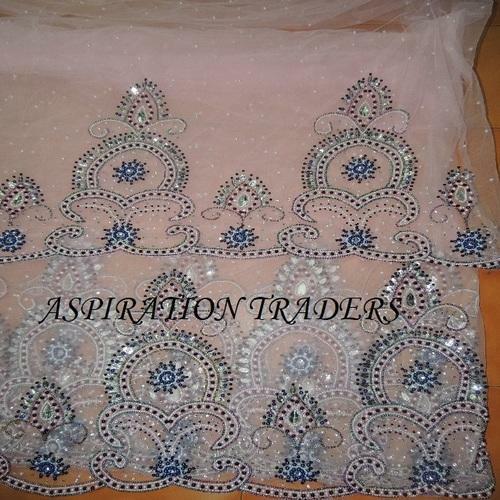 Computer lace offered by us is known for their high quality, excellent durability and light weight.